Backyard Renaissance Theatre Company, as a part of the La Jolla Playhouse Resident Theatre Program, presents the San Diego premiere of Smokefall. Change is in the air as Violet prepares to bring twin boys into the world. Inside her womb, her unborn sons contemplate their future, while the world around her is in transformation: her husband is secretly planning to leave her, her father is slipping into senility and her daughter has taken a vow of silence. Haunting and slyly funny, Smokefall explores the lives of this family in a lyrical treatise on the fragility of life and the power of love. San Diego Underground Film Festival and the Tenth Avenue Arts Center are proud to present a diverse and inclusive lineup of experimental, documentary, animated, and narrative films which are complimented by nightly expanded cinema performances, installations, and live music. Calling all whiskey & bourbon worshipers, tequila aficionados, gin guzzlers, rum radicals, vodka vixens and mixologists to indulge your senses and shake up your summer as you mix and mingle with thousands of people at the 10th annual San Diego Spirits Festival. 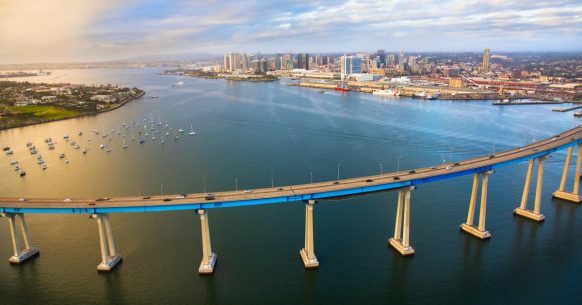 Experience Bike the Bay, a scenic bayside ride, and also enjoy a rare opportunity to ride over the San Diego-Coronado Bay Bridge. The Maritime Museum of San Diego and San Diego Folk Heritage present the annual Sea Chantey Festival Sunday aboard Star of India, the world’s oldest active sailing ship. San Diego Folk Heritage is a non-profit organization dedicated to preserving and promoting folk arts in Southern California. Visitors will enjoy sea chanteys and traditional folk music performed by popular local and national artists including The Jackstraws, Raggie Taggie, The Chanteymen and Kick Up the Dust. The Sea Chantey Festival is free and included with general admission to the Maritime Museum of San Diego. Join us for LeucadiART Walk, a revival of the original 80’s art event in historic Leucadia with art, entertainment, a children’s art pavilion and more.